Education has for centuries been one of the most powerful forces to enable and empower the human race. This is true even more so at a place like Pepperdine, where the pursuit of wisdom is charged by investigations of both faith and reason. In 1937 George Pepperdine envisioned that his namesake college would be a place of both intellectual and spiritual transformation, bolstered by the partnership between a world-class education and Christian values. Thus, the seekers of such pursuits—students—would be uniquely equipped to impact the world by leading purposeful lives with hearts to serve. Indeed, our students and alumni are fulfilling George Pepperdine’s vision: all around the world they are dedicating their time, hearts, and funds to causes and communities that would not survive without their contributions. The effects of these contributions will extend far beyond our lifetimes. Closer to home, generous giving by alumni, faculty, staff, and friends of the University is one of the only reasons many Pepperdine students are able to afford the unique opportunities for academic, personal, and spiritual growth that Pepperdine provides. Alumni like Sarah Madsen (’15) who, as a Seaver College student, experienced a transformation that was a direct result of the generosity of those who believed in the value of the Pepperdine experience. Madsen spent her freshman-year spring break serving Seattle’s Union Gospel Mission with Project Serve, an initiative that depends on the contributions of our community in order to thrive. There, she discovered the transformational work taking place at the nonprofit organization. Investing in Pepperdine also enables more students to have access to innovative programs and state-of-the-art spaces needed for eager minds to seek the global good. Services like the community counseling clinics at the Graduate School of Education and Psychology, which improve the quality of life for children, adolescents, adults, couples, and families by providing affordable, high quality, individualized counseling; the Global Justice Program at the School of Law, where law students and alumni gain practical experience in the advancement of human rights, religious freedom, and rule of law throughout the developing world; and the Davenport Institute at the School of Public Policy, where students, faculty, staff, and alumni develop the leadership skills that engage the citizens of California in the policy decisions that affect their everyday lives. It is imperative to come together as a community to “pay it forward” to future generations of Pepperdine students to help them become the leaders our world needs. Alumni support in terms of giving and endowment size is a key factor in measuring reputation, receiving foundation grant consideration, and even determining rankings. It has the power to position Pepperdine as the long-term leader in academia for the next 25 years and beyond. In 2016 only seven percent of our alum ni gave a gift of any size to Pepperdine. This is in comparison to Boston College’s 25 percent and Harvard’s even more impressive 35 percent. 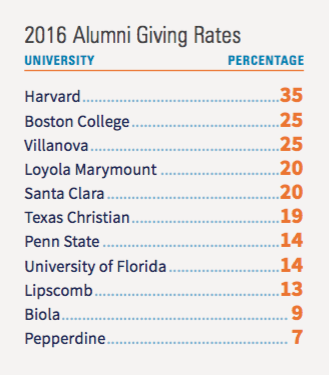 Even our top West Coast Conference rival, Loyola Marymount University, boasts alumni giving over twice our rate. Our $789 million endowment is nearly half the size of University of Florida’s $1.556 billion. Framed in another context, Pepperdine recently broke into the U.S. News & World Report top 50, tied with Pennsylvania State University—University Park, University of Florida, and Villanova University, as one of the nation’s “Best National Universities.” While that progress is exciting, our alumni giving percentage remains the lowest among these peer institutions by a significant margin. 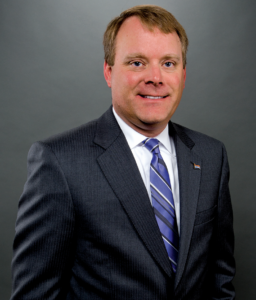 Alumni support—indeed, your support—is critical to our success and to continuing on this trajectory. We must do better, and I know we can. On Wednesday, March 8, 2017, Pepperdine will hostits first- ever University-wide giving day, Give2Pepp, which calls on each member of the Pepperdine community to give back on one extraordinary day. Building upon the University’s time-honored tradition of generosity, we will join together to support future generations of Waves with an enduring gift. We invite you to invest in any area, program, or school at Pepperdine that matches with your passion so you can see your dollars make a direct impact. It’s not how much—it’s how many. Beyond Give2Pepp, seize any opportunity to support the one-of-a-kind programs and experiences that have changed our lives. Your contributions make an extraordinary difference—in the lives of our students, in the imaginations of our faculty, and in the future of this vibrant university.